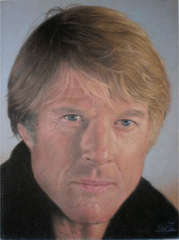 With nearly 80 acting credits to his name — from cinematic classics such as Butch Cassidy and the Sundance Kid, Barefoot in the Park, Inside Daisy Clover, Three Days of the Condor, The Great Gatsby, The Sting, The Way We Were, and All the President’s Men — Robert Redford (right) has had a career like few others in Hollywood. Now, one aspect of his work will soon come to an end. While he’ll still keep up directing and his championing independent voices after founding the Sundance Film Festival, he’s announced he’ll be retiring from acting after his next two features. When it comes to his last acting role, Old Man with a Gun — which is a re-team with his Pete’s Dragon director David Lowery — it sounds like the ideal send-off. His final films are due to be released in 2017. Along with continuing a career as a director, the 80-year-old — who won the Best Director Oscar in 1981 for Ordinary People — also sees himself returning to painting. He received his art training in Paris after dropping out of the University of Colorado. Other successes behind the camera include A River Runs Through It and Quiz Show. He garnered an honorary Oscar in 2002. Redford will remain the chairman of the annual Sundance Film Festival, held in Utah. The actor made the announcement in an interview with his grandson Dylan for the Walker Art Center. This entry was posted on Saturday, November 12th, 2016 at 12:02 am	and is filed under Blog by Manny Pacheco. You can follow any comments to this post through the RSS 2.0 feed. Responses are currently closed, but you can trackback from your own site.